Dissipation Constant is expressed in milliwatts per degree Celsius. It defines the amount of electrical power which, when dissipated in the thermistor, will raise the body temperature one degree Celsius above ambient temperature. Knowing the dissipation constant of a given thermistor will allow the design engineer to compute the amount of “Self Heating: in a particular application. The power dissipated in a thermistor is typically maintained at a very low level to ensure insignificant temperature measurement error due to self heating. However, some thermistor applications depend upon significant “Self Heating” to raise the body temperature of the thermistor well above the ambient temperature so the sensor then detects even subtle changes in the thermal conductivity of the environment. 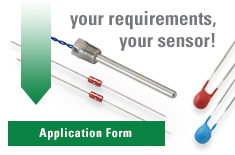 Some of these applications include liquid level detection, liquid flow measurement and air flow measurement.